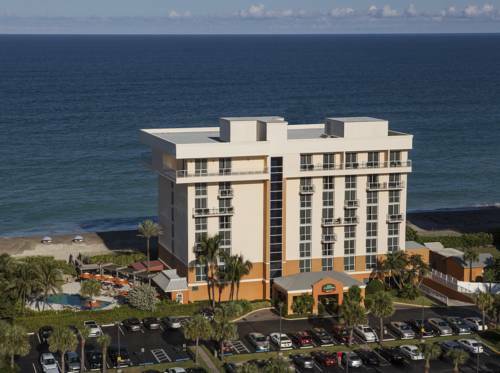 Casually cool vibes, tropical scenery and attentive services seamlessly blend at Courtyard Hutchinson Island Oceanside/Jensen Beach. Boasting an unbeatable oceanfront location, our hotel makes it easy to enjoy a day of surfing, snorkeling or simply relaxing under the sun. When it's time to escape the heat, relax in our nautical-inspired guest rooms, and connect with friends back home via our free Wi-Fi. Wake up every morning with a hearty breakfast sandwich and Starbucks coffee at The Bistro - Eat. Drink. Connect., then give yourself an adrenaline boost at our fitness center. For lunch or dinner, stop by Latitudes Outdoor Tiki Bar and Grille, our poolside restaurant serving casual American cuisine along with refreshing cocktails. Satisfy your wanderlust and explore some of the area's most popular attractions, including The Elliott Museum, Savannas Preserve State Park and Manatee Observation Center. Whether traveling with family or friends, there's something here for everyone at our Florida hotel. Your food and beverage destination for refreshing made-to-order breakfast choices in the morning. The Bistro also offers specialty beverages made with Starbucks coffee to help you get a jump on the day. Enjoy the warm Florida sun and a refreshing beverage at Latitudes Outdoor Tiki Bar and Grille. Our poolside hotel bar offers oceanfront seating and delicious casual dining. It's the perfect place to unwind after a day spent exploring Jensen Beach. ~67 miles from Jensen Beach.